When purchasing a roofing system that requires quite a bit of capital, it is easy to lose sight of what is really important: the quality and lifespan of the product. You want a roof that will protect your building and valuable assets for the entire time you occupy it, not a system that you will have to replace five times over. Before deciding on a roofing system, you need to uncover the real cost of your roof - costs occurring over the lifetime of the roof, not just the initial payments. The first thing you must consider is how you need your roof to function. Do you need your roof to last for a relatively long period of time, say 30 years, without needing to be replaced? Do you want a piece of paper that says your roof will last that long, or do you want a roofing system with proven performance for a little extra upfront cost? The piece of paper being referenced is your warranty. When looking at warranties it is easy to assume that the length of the warranty is the lifespan of the roof, however this is not guaranteed and warranties can easily be voided leaving the repair costs on you as the owner. When considering the initial costs of a roof you have to take into account both labor and product costs. Regardless of if you purchase a cheap or expensive membrane, you’ll still spend a good portion of the roof expense on labor. Chances are if you go with the cheapest option you are going to get the cheapest quality and lose the value of your roof immediately after the installation team leaves. Invest more in what you are leaving on your roof to ensure that you are protecting your building and assets. Maintenance is essential regardless of the type of roofing system you choose. The amount of maintenance and repairs vary drastically. High quality roofing systems can typically stand up against the elements more effectively than low quality systems, resulting in lower costs for you over the life of the roof. With low quality systems, UV rays can rapidly deteriorate your roof, resulting in chronic repairs or the need for a new roof much sooner than you had planned. These costs can add up quickly and result in a much more expensive roofing solution than originally planned. In some instances, high quality roofing systems can actually save you money long-term by keeping the cost of energy low. Energy savings do vary by month, geographical location, and insulation; however it can be a nice added bonus in addition to the other cost savings benefits of using a higher quality roof system. Similar to the phrase “you can’t judge a book by its cover,” you shouldn’t make a roofing decision based solely on the initial cost. The lowest initial cost typically does not equal the total lowest cost; an initially lower priced roof can actually be much more costly over the life of the roof. Make sure you are selecting a roofing solution that will last for its expected life. 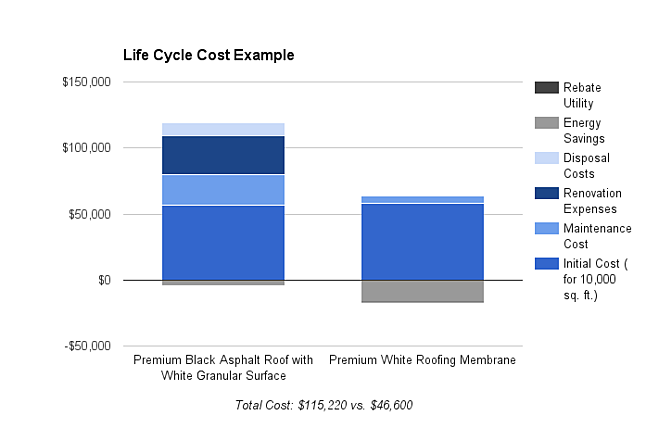 Source for data chart: Calculating the Life Cycle Cost of a Roof Whitepaper.